The first thing that strikes you about this model is how sleek it is. It has thoroughly modern lines and there doesn’t seem to be any arbitrary or trivial design elements to this unit. 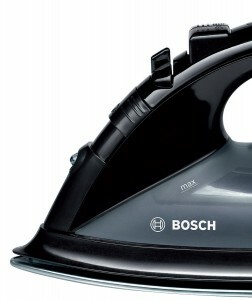 The Bosch TDA5620GB Sensixx Comfort Power Iron looks the way it looks for a definite purpose, to deliver solid heat and steam to your clothes as efficiently and effectively as possible. This steam iron is definitely modern from its anti-calcium deposit design to its ceramic ironing plate (soleplate) to its self-cleaning system. As promising as its key features may appear at first, does it deliver the goods as far as hassle-free, convenient, and easy steam ironing is concerned? 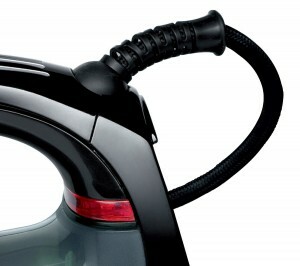 Powered by 2400 watts, this unit is fine for light to medium steam iron loads. However, if you are looking to iron a huge load of clothes or you’ll be ironing very heavy fabric, this might not be the unit for you. Thankfully, most average consumers and steam iron users don’t iron heavy loads of clothing on a regular basis. 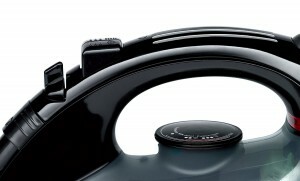 For the needs of the average consumer, this iron’s 2400 watts might be enough. If you like to iron quickly, this 2400 watt unit might be enough as you zip through your clothes. It is not overpowering but delivers enough heat to get the job done. Thanks to the easy gliding power of its soleplate, you won’t tire out very easily even if you make several passes at a spot that’s very hard to smooth out. However, given the fact that this unit weighs 1.4kg, you can tire out sooner than if it had been a lighter model. If you are looking to knock out wrinkles very quickly, you need two things: very high heat and a huge amount of water. The more steam your iron produces, the easier it is for you to smooth out a fabric. Unfortunately, compared to other models on the market, the Bosch TDA5620GB Sensixx falls short. It only delivers a steam boost of 120 grams per minute. While you can probably knock out light to even possibly medium creases with this amount of steam infusion, you will need a heavier dose of steam if you have to take out deeper creases. Another measure of steaming power is how many grams of continuous steam a unit produces in a minute. Based on this measure, this Bosch model is actually pretty decent. It isn’t spectacular but it definitely compares better than lower end Bosch and non-Bosch models. This unit produces as constant 40 grams per minute of steam. Not bad compared to lower end units that produce 30 to 35 grams per minute of steam output. One of the most common headaches steam iron users have involves low steam settings. At a low setting, droplets form from the steam and these droplets of water can cause havoc with your clothing. It can lead to uneven smoothing. You can also have the unpleasant experience of having to make several passes on a droplet-infused section to dry it out and then to steam it out. Instead of saving you time, your steam iron has made ironing your clothes an extended ordeal. Thanks to this unit’s DripStop technology, you don’t have to worry about low steam settings. 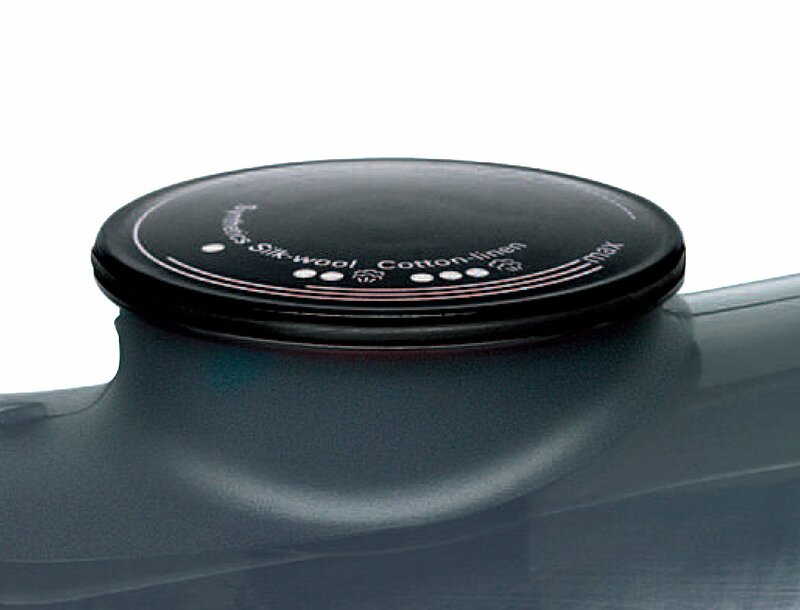 While water droplets may still form at low steam settings, the DripStop system prevents these droplets from falling on the clothing surface you’re working on. Avoid the unnecessary hassle of having to make extra passes by using this unit. Among the many factors that shorten the life of a steam iron unit, calcium is one of the most frustrating. Calcium is a headache because you often find out when it’s too late. Due to dissolved minerals in hard water deposits, calcium can form in the water channels of your steam iron. Normally, you don’t see this. You only find out when the performance of your steam iron has deteriorated to the point you need to buy a new iron. This can be very expensive if you go through enough irons. The good news with the Bosch TDA5620GB Sensixx Comfort Power Iron is you don’t have to take calcium lying down. You don’t have to just accept the fact that calcium deposits happen. With this unit, you get a steam iron that has an automatic extra lease on life. Thanks to the TDA5620GB’s AntiCalc technology, water channels in its cartridge are designed to minimize the build up of calcium. Don’t get me wrong-calcium can and will still build up. The big difference is that it doesn’t build up as quickly as steam iron models without this technology. meter cord. This is definitely a welcome length because the longer the cord, the more you can move around. Depending on the area of your home where you do your ironing, you might need a little elbow room for maximum efficiency. This unit definitely has a cord that’s long enough to give you a good range of motion. The downside to this model’s cord is that its cloth covering (instead of all plastic covering and construction) has been reported to kink. As a result, while you were given 3 meters of cord length, once kinking comes in, the actual working cord length for this model might turn out to be well short of 3 meters. Talk about a bummer. 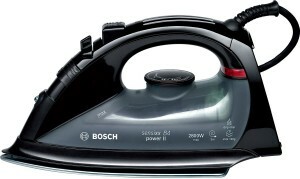 Overall, the Bosch TDA5620GB Sensixx steam iron is a solid choice if you’re looking for a light duty iron. However, it would make for a good choice for a home iron. It might not be a good idea to take this iron when on the road. If you’re on the road, you need a lighter model that you can pack, unpack, and lug with you as you zip from Point A to Point B. If you are looking for heavy duty ironing, you might want to look at another model.